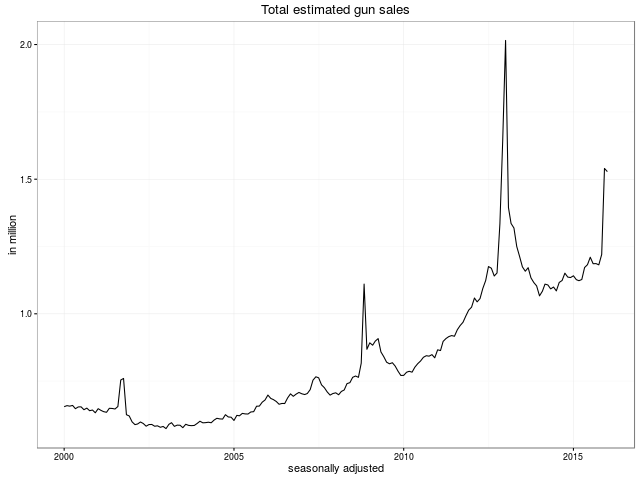 Statistical analysis of monthly background checks of gun purchases for the New York Times story "What Drives Gun Sales: Terrorism, Obama and Calls for Restrictions" at < http://www.nytimes.com/interactive/2015/12/10/us/gun-sales-terrorism-obama-restrictions.html?> is provided. 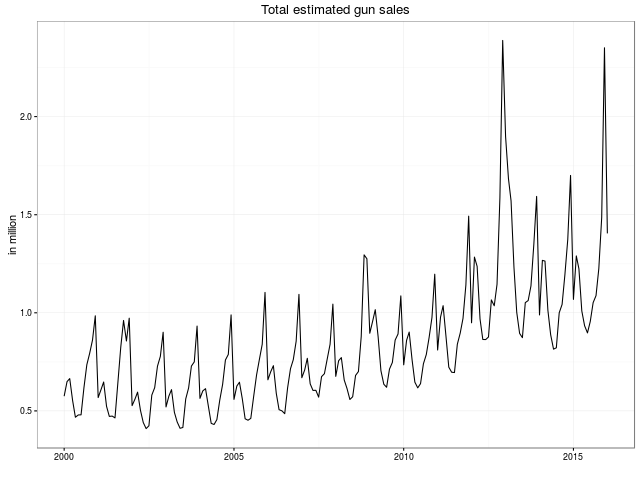 Statistical analysis of monthly background checks of gun purchases for the New York Times story What Drives Gun Sales: Terrorism, Obama and Calls for Restrictions. 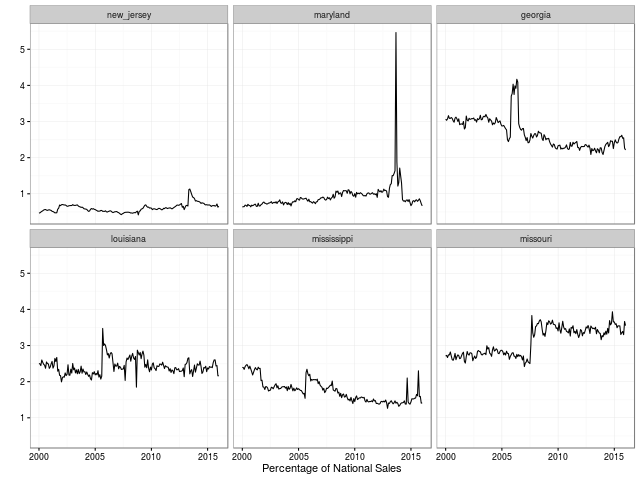 This package depends on the R package seasonal for the seasonal adjustments, which itself uses a program called X-13ARIMA-SEATS. Windows, OS X and Linux binaries for this program are installed by the R package x13binary. The source data comes from the FBI's National Instant Criminal Background Check System, and was converted from the original PDF format to CSV using Tabula. BuzzFeed also released the same dataset on Github last week. 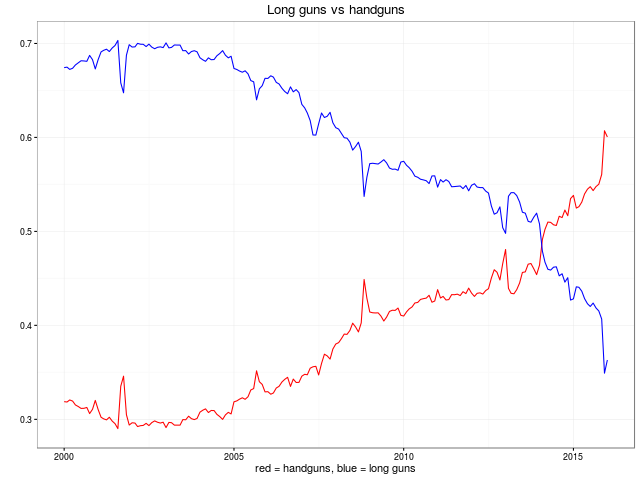 To convert background checks into estimated sales, we relied on a method suggested in the Small Arms Survey by Jurgen Brauer, a professor at Georgia Regents University. 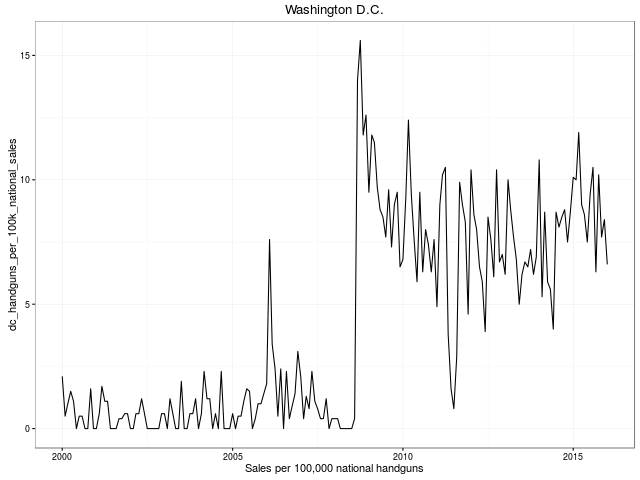 Each long gun and handgun check was counted as 1.1 sales. Each multiple-gun check was counted as two sales. Permit checks and other types of checks were omitted. 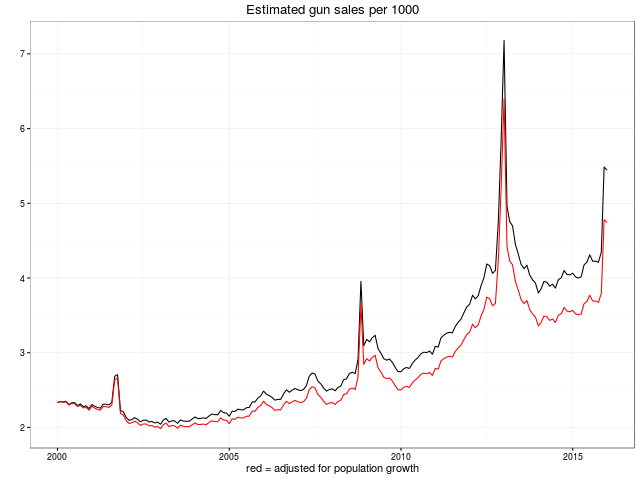 The multiplier is an estimate based on Mr. Brauer's interviews with gun shop owners. Note: In our computation, we excluded background checks for the "multiple" category in California because they followed an unusual pattern that did not match California gun sales data.